Filipe Bidart, Mixel Bergougnan, Xan Koskarat, Gabriel Mouesca, Enaut Haritxelar, Ttote Etxeberte were either born in the late 1960s or already in their twenties. They are all ex-members of Iparretarrak (IK, literally “those of ETA in the North”), a clandestine organisation that evolved in the French part of the Greater Basque country (Iparralde or Ipar Euskal Herriko) from the late 1960s until 2000. The journalist Sylvie Garat met them. They talked openly about the genesis of IK and the armed struggle. 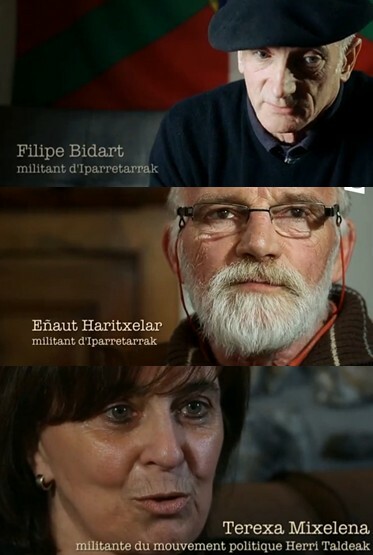 The result is a documentary, “Génération des Autonomistes Basques” [A Generation of Basque Autonomists], to be released on National French TV (channel FR3) in October 2014. Sylvie Garat (2014), Génération des Autonomistes Basques, produced by 13 Productions and France 3 Aquitaine – 52 min. Very little scholarly attention has been given to Iparretarrak (commonly known as IK). When mentioned, the French Basque armed organisation is very often presented as a simple low-intensity offshoot or as a copycat of its southern and more famous older brother ETA. Obviously, the evolution of nationalism in the Basque territories of Spain and ETA had a great influence on IK. However, IK was really born from the uphill struggles for cultural, linguistic and institutional recognition in the French Basque country (Iparralde) and as such should be understood within these particular political mobilisations and aspirations. In her documentary Génération des Autonomistes Basques, Sylvie Garat makes no mistake about it. The spectator is ushered into the documentary by a series of peaceful and dreamy pictures of the coastline – between Bayonne, Hendaye and Saint-Jean-de Luz –, and moving pictures of the verdant gentle rolling hills of the hinterland of Iparralde where every white façade is cladded with timber beams painted in red. The tableau appears timeless, as though it could have been unfolding centuries ago, but two details tie the scene firmly to the present-day French Basque country. On the façade of a first derelict little house in the middle of a luxurious field, the graffiti written in French “Basque country is not for sale” echoes the following one painted in big letters on an isolated and abandoned house on the top of a hill: “IK”. After Terreur d’Etat au Pays Basque [State Terror in the Basque country] in collaboration with Arthur Mac Caig (2000), Génération des Autonomistes Basques is the second production of Sylvie Garat dedicated to the contemporary history of the Basque country. Génération des Autonomistes Basques is a 52 minutes-long series of close-up interviews interspersed with archival film footage of the attacks perpetrated by IK, press coverage and movies on the Basque country in the 1960s and 1970s. There is no voiceover narration and biographic details about each interviewee are reduced to the minimum – a name followed by a very short description (“member of IK”, “militant of Herri Taldea”…). Anonymous as such, they talk calmly about the Basque French society, their first protest for the defence of the Basque language, the social movement for the instauration of schools in Basque (ikastola), May 68, the struggle against mass-tourism and the trivialisation of Basque culture, the first violent actions, the armed struggle, ETA and the death of their comrades. They were Basque and proud of it. They are still Basque and living in Iparralde. They were convinced of the necessity to push the “conservative and fossilised” Basque society toward the Left. They are still abertzale, Basque patriot and socialist. They were strongly opposed to the trivialisation [“folklorisation” in French] of the Basque culture and could not bear to see Iparralde becoming a paradisiac land for tourism and property speculation – “to transform the Basque country into the sunbath-dumbass of Western Europe!” as Ellande Socarros put it in the documentary. They were members of the first and second generations of IK or members of the political movement Herri Taldeak. They are no longer members. In her documentary, Sylvie Garat has used the indirect interview technique. It certainly gives a rhythm to the documentary. Filipe Bidart – a black beret firmly ensconced on his head and a Basque flag behind him, Mixel Bergougnan, Xan Koskarat, Joanes Borda, Gabriel Mouesca and the others are singing from the same hymn sheet. There is no discrepancy in their memories of their early path into political action through to their retrospective judgements. One can assume that by deliberately stepping aside, Sylvie Garat wants each of the interviewees to speak for himself and give us, spectators, a story of IK, of that generation of Basque autonomists in their own words. But, does it work? It is not entirely convincing – regrettably. The ambition of the documentary is not so clear. Is it about enlightening us about a somewhat forgotten clandestine organisation? Is it about how ex-members live and deal with their past? Or is it about a series of still topical issues for the French Basque country that once led to armed struggle? If one assumes that the documentary is about the story of IK told by its principal actors, how far the documentary moves us on in our understanding of IK is not clear either. Clearly, the documentary highlights very well how the evolution and the story of IK is a story of a clash between France itself and its difficulty in recognising local cultural and linguistic claims on the one hand and, the rise of a more leftist Basque movement embedded in the spirit of May 1968 and prepared to fight back on the other. But what the documentary tends to mystify is the incredibly active and diversified French Basque nationalist movement itself, as if Sylvie Garat was taking for granted what Filipe Bidart, the charismatic leader of IK is saying about the appalling and conservative state of politics in Iparralde in the 1960s. IK was a reaction but not a reaction in an empty vacuum of political mobilisation. On the contrary, the incredible complexity of political mobilisation is not really brought out in the documentary. Influenced by the first waves of ETA refugees seeking asylum in Bayonne in the early 1960s, French Basque nationalism was burgeoning again, mixing old and new grievances. 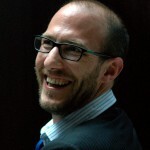 The old ones, centred on claims to improve the status of the Basque language and the creation of a distinct département, were cohabiting with new ones more focused more on the consequences of deindustrialisation, rural de-population, mass-tourism and issues on the status of political refugees. As such, it would have been interesting to add an alternative voice in the documentary: by interviewing members of the 1950s Basque student movement Embata, or members of the political movement Enbata born after the nationalist congress in Itxassou (1963), it would have given a more accurate picture of the political French Basque context out of which IK emerged. Furthermore, by giving very little information about each interviewee, the documentary unfortunately dismisses an important sociological fact about both the creation of IK and the structuring of French Basque nationalism. While the militants of Enbata were coming mostly from the educated classes of the urban coastal cities, militants of IK were coming principally from the working-class and rural interior of the French Basque country. Despite these quibbles, one should note that Génération des Autonomistes Basques is the first documentary dedicated to IK where members of IK are interviewed. It is also the first documentary on IK that will be released on French national TV. That alone is praiseworthy.